Officially, Otter Creek is a 4.6-mile loop and part of the Platte Plains Trail, a nearly 15-mile network that stretches from the Platte River Campground to Esch Road and includes four trailheads. But while Otter Creek is connected with Bass Lake Loop and thus Lasso Loop, for most hikers its a distinct outing on its own. Otter Creek is described here as a 5.7-mile trek that combines the trail, a segment of Bass Lake Loop and portions of Aral and Deer Lake Roads, narrow, seasonal two-tracks. 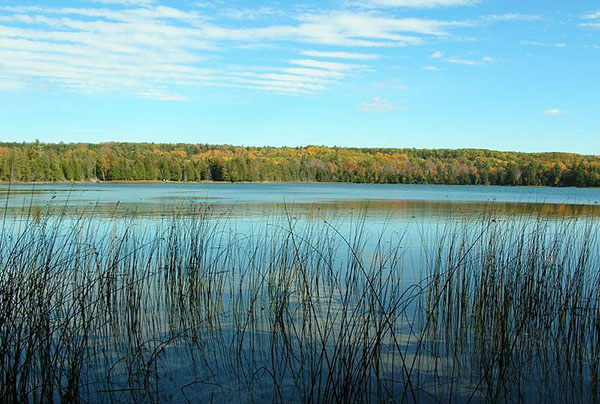 This route leads along both sides of the creek as well as the shorelines of three pristine lakes: Otter, Bass and Deer. Officially, Otter Creek is a 4.6-mile loop and part of the Platte Plains Trail, a nearly 15-mile network that stretches from the Platte River Campground to Esch Road and includes four trailheads, a walk-in campground and 4 miles of incredibly beautiful beach along Platte Bay. But while Otter Creek is connected with Bass Lake Loop and thus Lasso Loop, for most hikers it’s a distinct outing on its own. Otter Creek is described here as a 5.7-mile trek that combines the trail, a segment of Bass Lake Loop and portions of Aral and Deer Lake Roads, narrow, seasonal two-tracks. This route leads along both sides of the creek as well as the shorelines of three pristine lakes: Otter, Bass and Deer. For many, the appeal of Otter Creek Loop is neither remote beaches nor its link to Michigan’s logging era but the possibility of viewing wildlife, particularly birds. The mix of woodlands, dunes, shoreline and shrub-scrub wetlands makes the area one of the best in the national lakeshore for birding. Among the birds that may be encountered are bald eagles, Sandhill cranes, herons, rails and a variety of waterfowl that frequent the creek and surrounding wetlands. In late May, Otter Creek is an excellent place to see migrating warblers, while in the summer scarlet tanagers and Baltimore orioles can be spotted in the woods along the roads and two-tracks. The first leg of Otter Creek Loop is Aral Road, a narrow two-track that is followed for more than a mile and makes for easy hiking. The road begins by crossing a vehicle bridge over Otter Creek and then climbs above it. Along the way, two beach access trails, posted with keep-your-swimsuit-on signs, are passed before Aral Road swings out of view of the creek at Mile 0.5. A third beach access trail is passed and then at Mile 1.2 a gate prevents vehicles from traveling any further. 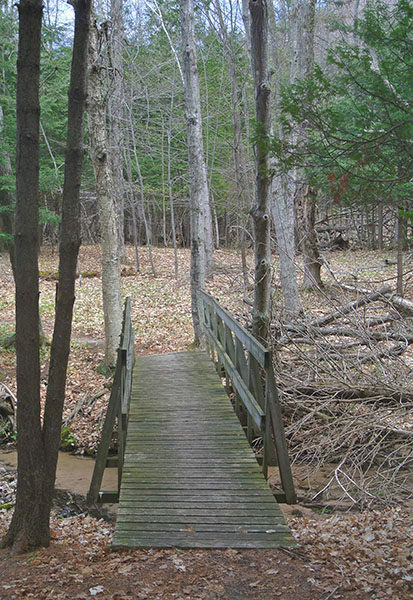 Beyond the gate, a wide foot path replaces the old two-track and continues south into the pine-hardwood forest where in less than a half mile it reaches the northwest corner of Otter Lake. This scenic spot is posted and makes for a great place for a break. 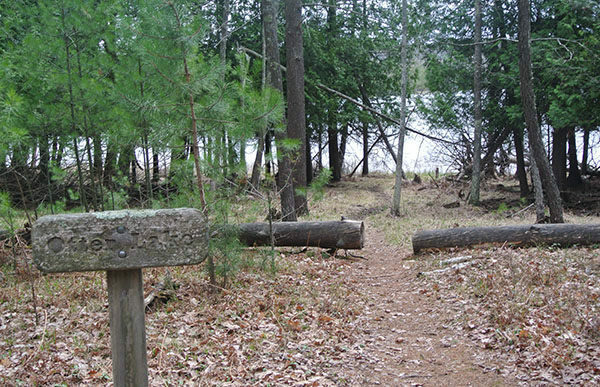 The trail briefly skirts the shoreline and then passes one of the few private cabins on Otter Lake, using its access road to arrive at Trail’s End Road and the Bass Lake Loop Trailhead at Mile 2. 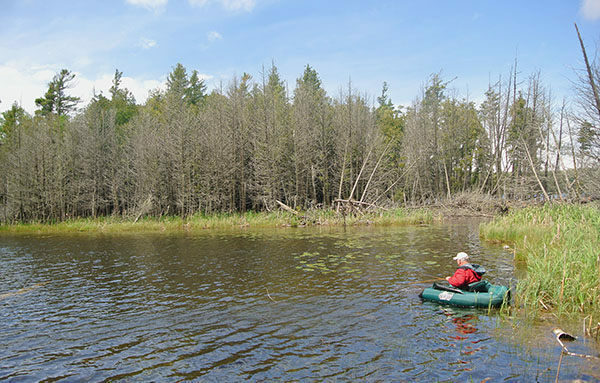 The day-use area of Bass Lake includes vault toilets, picnic tables, a fishing pier and a canoe launch. At the trailhead, post No. 4, one trail heads west for the White Pine Backcountry Campground on the Lasso Loop. The other heads south for post No. 15. Go south and you’ll skirt the scenic lake and then climb above it for a view of the entire body of water. Post No. 15 is reached at Mile 2.5 and marks the junction of the spur to the winter-only Ski Trailhead on M-22. In less than a quarter mile east on the ski trail spur, you break out at the south end of Deer Lake, the smallest of the three. The trail skirts it briefly, allowing you to search for wildlife, particularly beavers and otters, before arriving at post No. 16 on Deer Lake Road at Mile 2.9. The ski trail spur continues east, while heading north is Deer Lake Road, another seasonal two-track open to vehicles. There are more views of Deer Lake and then Bass Lake before returning to Trail’s End Road, marked by post No. 2 at Mile 3.4. On the north side, the trail passes another private residence on Otter Lake and then follows Hemlock Road to a second gate, this one blocking vehicles from continuing onto Otter Creek Loop from the two-track. Otter Creek Loop is now a level foot path that heads north through the forest and small meadows and reaches a foot bridge at Mile 4. Beyond the stream you skirt the base of a steep wooded dune that at times rises more than 110 feet. The imposing bluff remains for a while before the trail swings west near Otter Creek at Mile 4.8 and then enters an impressive stand of cedar. Eventually, a red pine plantation takes over and at Mile 5.7 you pop out of the pines at post No. 1 and the Otter Creek Loop trailhead on Aral Road. The end of Esch Road is a day-use area that includes limited parking, access to the beach and a vault toilet. There is no source of drinking water however. A vehicle permit is required to park at the trailhead and is available at the Philip Hart Visitor Center (231-326-5134; www.nps.gov/slbe) in Empire or during the camping season at the Ranger Contact Station (231-326-4700, ext. 5029) at the Platte River Campground. From Empire, head south on M-22 for 3.8 miles and then west on Esch Road for 1.3 miles. Just before the beach access at the end of Esch Road is Aral Road, a two-track that heads south and in 100 yards passes the Otter Creek Loop trailhead and post No. 1.